Some of the tunes on Ive Forgotten Everything meander in a happy, child-like way  such as the upbeat Big Women on the Shelves, the albums happiest and most triumphant moment. Others are more serious-minded, such as the stark setting for a creepy-funny lyric titled Cave. That one opens with a solo trumpet playing a series of descending intervals, then switches to an ascending series of mildly dissonant chords led by a solo cello: Its almost Schmidts Symphony 4 in miniature. The simplest melody of all is reserved for the closing number, See You Again  yet even then, the leitmotif of aging returns, as the final lines are sung by the Northside Senior Center Chorus. From Brooklyn, of course. Lee Feldmans Ive Forgotten Everything is unlike anything else in contemporary pop. The songs are alternately sad, whimsical, harrowing, and very funny (although the albums best laugh may be the visual joke on the disc itself). A third of the tunes are waltzes, and all of the melodies are catchy and challenging in more or less equal measure. Above all, the writing voice behind it all is kind, humane, and clever without being too clever: Theres nothing arch about Feldmans music. Every one of these songs is like a smile you cant read, yet that pulls you along in spite of yourself. 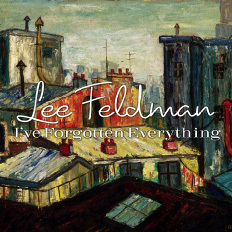 Lee Feldman is one of the few musicians in contemporary pop whom I think of an artist, and Ive Forgotten Everything is far and away his best work so far. If you have a passion for good songwriting, you need this album. Previous Summer Feldman Happened So Fast!